A married couple who met on their ophthalmic optics course returned to City for the Golden Anniversary Alumni Celebration. 1967 is a memorable year, the first issue of Rolling Stone was published, NASA launched the Lunar Orbiter 3 and The Beatles released Sgt. Pepper's Lonely Hearts Club Band. However, it was also the year that Ted and Kathy Kemplen, (Dip Ophthalmic Optics), graduated from The City University, as City was known back then. 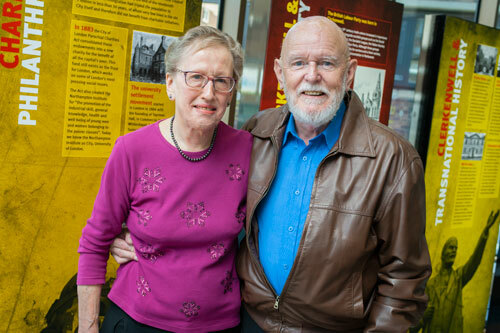 The couple who met in their halls of residence in 1964, joined over 50 other alumni in returning to see what has changed at City over the last 50 years. Ted said: “We met the day before we started our course as we were living together in the Northampton Halls on Bunhill Row. “I was 21 and Kathy was 19, and we were chosen to be partners for our optometry coursework. We were very close to the Whitbread Brewery and would often enjoy a pint after our seminars. “We got married in 1969, two years after we graduated and in two years from now, it will be our golden wedding anniversary – so we will need to get planning for that! Kathy said: “One thing I remember about our halls was that it was a very social place. There were always dances happening in the evening and someone was always organising an event. “There was the yearly May Ball, where a band would come and perform for us, I remember dancing with Ted every year at the ball. “We were partners both professionally and personally in our final year of university, and after we graduated we opened two eye practises in Welwyn and Cheshunt. So we obviously didn’t fall out – or at least not very often! Also at the Golden Anniversary celebration was Judith Walker, (BSc Mathematics, 1968), who was the only female student in her class at the time and Bruce Young, (BSc Civil Engineering, 1967), who was an editor at The City University student newspaper, The Beacon.